Let’s face it, a criminal record is not a good thing when it comes to employment opportunities and other things that require a background search. Even when the criminal offense is non-violent and unintentional, like DWI, it can negatively impact a person’s future. Our Texas lawmakers recognized this stigma and did something about it. This past legislative session (2017), Texas lawmakers from both sides of the aisle proposed legislation to help expand the opportunity to seal criminal convictions with an order of non-disclosure. What is an Order of Non-Disclosure? Having your record “sealed” is common verbiage used by laypersons. Under Texas law, this is referred to as non-disclosure. Orders of non-disclosure “seal” a criminal record from the eyes of the general public and allow a person to deny such record in most situations. However, the offense will remain visible to law enforcement, state and federal authorities, and employers in government fields. Before the legislature acted in 2017, the Texas Government Code required a court to issue an order of nondisclosure of criminal records for a person receiving discharge and dismissal of certain nonviolent misdemeanors for which the person was placed on deferred adjudication community supervision (probation). The code also allowed for some “second-chance” considerations under limited circumstances. However, the Texas Government Code did not previously allow for nondisclosure of DWI offenses under any scenario. Governor Greg Abbott signed HB 3016 on June 15th, 2017. HB 3016 will be effective, retroactively, beginning September 1, 2017. 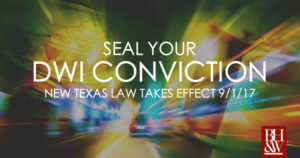 This law amends and expands the Texas Government Code to allow a person convicted of nonviolent misdemeanors, including DWI’s, to petition the court for orders of nondisclosure under certain circumstances and alters some waiting periods. HB 3016 also allows a person to petition for an order of nondisclosure of criminal history if that person was ineligible to receive an automatic order based solely on a judge’s affirmative finding that issuing such an order was not “in the best interest of justice.” If the offense was a misdemeanor punishable by a fine only an individual may petition for an order of nondisclosure immediately upon the date of completion of their sentence. However, if the misdemeanor was not punishable by fine only, they must wait until the second anniversary of the date of completing the sentence to petition. See the full text of HB 3016 – Enrolled version. HB 3016 now allows a person convicted of a first-time Driving While Intoxicated offense with a blood-alcohol concentration (BAC) less than 0.15 to petition for an order of non-disclosure of criminal history related to that offense. However, there are certain criteria that must be met to be eligible to petition for a non-disclosure of a Texas DWI. 5 years if there was no interlock requirement as part of the sentence. Additionally, the court will not issue an order of nondisclosure if an attorney representing the state presents evidence sufficient to the court that demonstrates that the underlying offense, for which the order was sought, resulted in a motor vehicle accident involving another person (this includes a passenger of the defendant). When may you Petition the Court for an Order of Non-Disclosure for a DWI? was restricted to operation of a motor vehicle equipped with an interlock device for at least 6 months. If the court did not impose the above conditions, they are required to wait until the fifth anniversary of the date of completion of their sentence. NOTE: Having a first-time DWI sealed by an Order of Non-Disclosure will NOT prevent another DWI from being charged as a DWI (Misdemeanor Repetition). What are the Disqualifying Factors for DWI Sealing? *If the waiting period has not expired, but all other conditions are met, the applicant must simply wait until the waiting period is complete. Which Offenses are Specifically Excluded from Consideration for an Order of Nondisclosure? 49.065 (operating an amusement park ride while intoxicated). Additionally, any conviction under Chapter 71 of the penal code (engaging in organized criminal activity) may not be non-disclosed. any other offense involving family violence. HB 3016 makes it easier for persons with certain low-level nonviolent offenses, particularly DWI’s, to obtain employment and become productive members of society. However, subsequent offenders will remain accountable because law enforcement may still use the “sealed” conviction against subsequent offenses and certain entities will still be able to view the offense. Contact Barnett Howard & Williams today and let our team help you determine whether you may be eligible for a non-disclosure under this law when it takes effect in September 2017. We are happy to provide a free consultation to walk you through the steps for sealing your record. Call our attorney today at (817) 993-9249. On June 9, 2016, the Governor signed SB 179 into effect—otherwise known as David’s law. David’s law, named after David Molak, a 16 year-old boy who committed suicide after relentless cyberbullying, was created in an effort to punish such reprehensible actions. 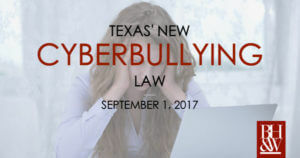 In 2011, lawmakers added the term “cyberbullying” to the Texas Education Code under the bullying section. However, this provision did not create any legal punishment for cyberbullying. It only required school districts to develop their own policies to prevent and intervene in such cases. David’s law changes this by amending the Education Code regarding bullying to include cyberbullying as a criminal offense. causing a student reasonable fear of harm. Bullying also occurs when there is ongoing, severe, and persistent statements or physical acts that create an intimidating, threatening or abusive educational environment for a student. Furthermore, cyberbullying includes such conduct that substantially interferes with a student’s education, substantially disrupts school, or infringes the rights of the victim at school. Cyberbullying occurs when a person uses any electronic communication device to engage in any type of bullying described above. Relevant communications include, for example, statements made through social media outlets or text messages. Where does Bullying/Cyberbullying have to Occur? Schools must install a way for students to report bullying/cyberbullying anonymously. Additionally, upon receiving a report, school officials must report the incident to the alleged victim’s parents within three business days and to the alleged bully’s parents within a reasonable time. Furthermore, under David’s law a school may, but has no legal obligation to, report conduct constituting assault or harassment to the police. A report may include both the name and the address of each student believed to be involved. Cyberbullying will be classified as a Class B misdemeanor beginning September 1, 2017. However, the offense becomes a Class A misdemeanor, if the offender has been previously convicted of cyberbullying or if the bullying was done to a victim under 18 years-old with the intent that the minor commit suicide or self inflict serious injury to themselves. Additionally, a student charged with cyberbullying can face administrative sanctions such as expulsion or alternative schooling. A Class B misdemeanor is punishable by a fine not to exceed $2,000 and confinement in jail for a term not to exceed 180 days. A Class A misdemeanor is punishable by a fine not to exceed $4,000 and confinement in jail for a term not to exceed one year. in school zones, all drivers are prohibited from texting and using handheld devices while driving. 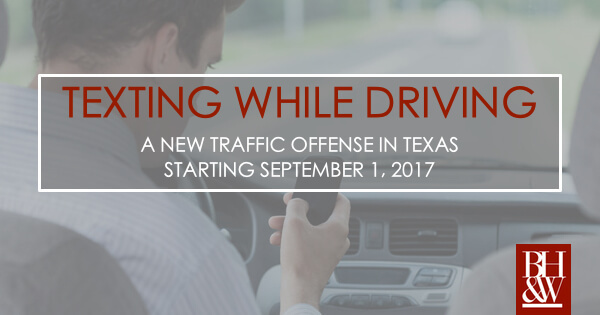 However, after many failed efforts, Texas has finally passed a law banning the use of handheld devices in certain situations, namely texting. On June 6, 2017, Governor Greg Abbott signed HB 62, which makes using a portable wireless communication device (i.e. a cell phone) to read, write, or send an electronic message (i.e. a text) while operating a motor vehicle a misdemeanor offense. The Texas Department of Transportation will be required to post signs on interstate and U.S. highways entering the state indicating that texting while driving is prohibited and carries a fine. Additionally, the new law requires that the driver’s license test cover knowledge about the effects of texting while driving or other actions that constitute distracted driving. What is the Punishment for Texting While Driving in Texas? However, if at trial for the offense it is shown that the defendant caused the death or serious bodily injury of another person, the offense will become a Class A misdemeanor punishable by a fine not to exceed $4,000 and confinement in jail for a term not to exceed one year. Additionally, if the conduct constituting the offense is also a violation of another law, the defendant may be prosecuted under either law, or both. Additionally, the law does not apply to drivers of authorized emergency or law enforcement vehicles acting in an official capacity or to drivers licensed by the Federal Communications Commission operating a radio frequency device other than a portable wireless communication device. Furthermore, the law prohibits the search and seizure of a driver’s cell phone unless authorized by another law. Supporters of the law believe it will increase safety and reduce distracted driving incidents, while opponents see it as an overreach of the government into citizen’s lives. Some fear the law will allow law enforcement to gain more power to stop citizens by mistaking a person’s legal actions for texting. However, despite these reservations, this law takes effect on September 1, 2017, preempting local ordinances, and applies only to offenses committed on or after that date. What is the Lautenberg Amendment? 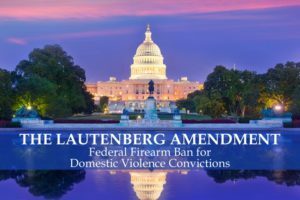 The Lautenberg Amendment to the Gun Control Act enacted in the Fall of 1996 provides that those with a conviction for a misdemeanor crime of domestic violence cannot use, possess, or transport a firearm or ammunition. Senator Frank Lautenberg was the chief sponsor of this amendment. The purpose behind this amendment is to keep firearms out of homes where a domestic violence relationship exists. 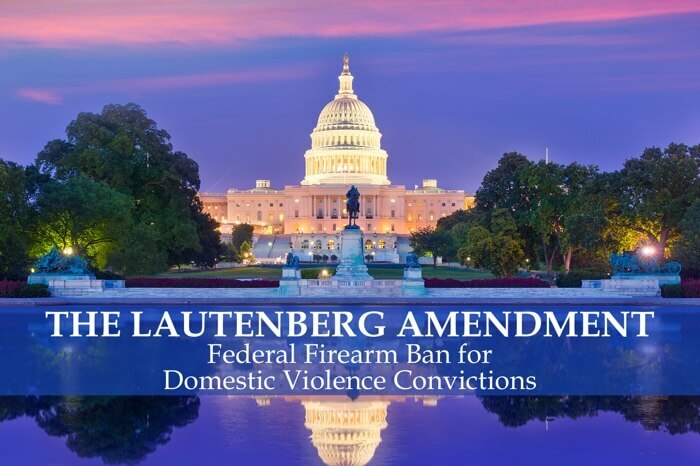 Lautenberg presented it with the idea that domestic violence and firearms are a deadly combination and enacting this amendment would lessen the likelihood of a victim to die during a domestic violence episode. 142 Cong Rec S 11872. Additionally, since there was already a firearm ban in place for felony convictions, this Amendment combats the devastating loophole that previously allowed persons with misdemeanor convictions of domestic violence to fall through the cracks and be permitted to own firearms. United States v. Hayes, 555 U.S. 415. When Does the Lautenberg Amendment Apply? A defendant will not be considered convicted unless they were represented by an attorney or “knowingly and intelligently” waived that right and the case was prosecuted at a jury trial or the defendant “knowingly and intelligently” waived that right by a guilty plea or otherwise properly waived that right. Id. If you have been charged with a qualifying misdemeanor conviction, the amendment has no impact on you until you have received a final conviction. However, if you are subject to a protective order, the Gun Control Act and the State of Texas separately provide that you cannot use, possess, or transfer firearms. 18 U.S.C. § 922(d)(8); Tex. Fam. Code § 85.022(b)(6); Tex. Pen. Code § 46.04(c). In Texas, if you have disposed of your case through deferred adjudication, which is not a final conviction, and you successfully complete the deferred adjudication, the amendment will not impact you since the statute requires a conviction. 18 U.S.C. § 921(33). Additionally, the conviction element of this statute will not be satisfied if the conviction is expunged, set aside, or the defendant has been pardoned. Id. What Impact Does the Lautenberg Amendment Have on the Military Defendant? Prior to the Lautenberg Amendment, 18 U.S.C. § 925(a)(1) provided a military and law enforcement exception to the Gun Control Act. The Lautenberg Amendment contains no similar exception. What this means for the military defendant that gets a conviction is that his service could be compromised since they can no longer use, possess, or transfer a firearm. This conviction can impact their ability to re-enlist, cause a transfer to a military occupational specialty (MOS) that doesn’t require the handling of firearms, and affect the ability to be deployed. Many servicemembers that receive a domestic violence conviction will be processed for administrative separation. According to the Supreme Court, What Cases are Considered Misdemeanor Convictions of Domestic Violence? In Voisine v. United States, the Supreme Court clarified that the federal firearm ban under the Lautenberg Amendment applied to every case where the underlying conduct was an act of domestic violence, regardless of whether the state court made an affirmative finding of domestic violence (or family violence in Texas). This means that persons with misdemeanor convictions anywhere from a Class C simple assault* to a Class A assault with or without a domestic violence finding are banned from using, possessing and transferring firearms if their victim was one with whom they had a domestic relationship. The legislative history and plain language of the statute lead to such a conclusion. Looking to the statutory definition of an applicable misdemeanor conviction provided above, there is no specific mental state required. The definition provides that the Amendment applies to any misdemeanor under federal, state, or tribal law that was committed by a person through use of physical force against a victim with whom they have a domestic relationship. *Class C is the same level as a traffic ticket. In Texas, a person who has been convicted of a misdemeanor involving family violence cannot possess or transfer a firearm or ammunition for 5 years after they are released from confinement or after they have completed and been released from community supervision following the conviction. Tex. Pen. Code § 46.04(b). The Texas Family Code defines family violence as “an act by a member of a family or household against another member of the family or household that is intended to result in physical harm, bodily injury, assault, or sexual assault or that is a threat that reasonably places the member in fear of imminent physical harm, bodily injury, assault, or sexual assault.” Tex. Fam. Code § 71.004. Additionally, under Section 22.01 of the Texas Penal Code an assault involving the person’s family or household occurs if the person causes bodily injury to another, threatens a person with “imminent bodily injury,” or causes physical contact with someone that they know or should know would find “offensive or provocative.” From these definitions you can see that a misdemeanor conviction of domestic violence in Texas expands the qualifying convictions beyond those that qualify under the Lautenberg Amendment. Tex. Code Crim. Proc. Art. 27.14. Texas law does not require the defendant to surrender firearms or ammunition once the possession is prohibited. Neither does Texas law specifically authorize or require the removal of firearms or ammunition from the scene of a domestic violence incident. In short, Texas law provides a prohibition of gun possession for five years after release from confinement or probation in more circumstances than under the Lautenberg Amendment. However, if your conviction is also a qualifying conviction under the Lautenberg Amendment then your right to possess a firearm is indefinitely prohibited. If you find yourself in that situation your only option to restore your firearm rights is to request a full pardon and restoration of civil rights in your pardon paperwork. Are You Currently FacingDomestic Violence Assault Charges in Tarrant County? Whether you have already been convicted or are currently facing charges of assault it is extremely important to know the heavy consequences that are attached to convictions where the underlying conduct is considered domestic violence. There are many misconceptions out there on whether federal firearm ban applies to a specific assault case. It is important that you know for a fact whether it applies to you so that you don’t risk violating federal law. If you are facing charges for an offense involving family violence under Texas law, contact our criminal defense team and schedule a free consultation to discuss and determine what consequences you are facing and whether the federal and/or Texas firearm ban applies to you. 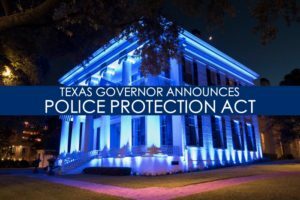 On Monday, Governor Greg Abbott called on both citizens and Texas lawmakers to get behind his proposed Police Protection Act in the 2017 legislative session. “While our state and the nation continue to mourn the heroes lost in Dallas, it is time for us to unite as Texans to say no more,” says Governor Abbott. The proposed legislation will strengthen penalties against those who are convicted of crimes where police officers are the target. Just this month alone, five Dallas police officers have been fatally shot and nine others injured when a shooter targeted police following a public demonstration. This past weekend, three Baton Rouge police officers were gunned down by a shooter who was also targeting law enforcement officers. The purpose of the Police Protection Act (the “Act”) is to “make clear to anyone targeting law enforcement officials that their actions will be met with severe justice.” Under the proposed Act, Governor Abbott will extend hate crime protections to law enforcement officers, increase criminal penalties for any crime in which the victim is a law enforcement officer, whether or not the crime qualifies as a hate crime, and create a culture of respect for law enforcement by organizing a campaign to educate young Texans on the value that law enforcement officers bring to their communities, among other provisions. “At a time when law enforcement officers increasingly come under assault simply because of the job they hold, Texas must send a resolute message that the State will stand by the men and women who serve and protect our communities,” says Governor Abbott. Governor Abbott’s proposed Act would make the police a protected class, where penalties for those perpetrating crimes against law enforcement would be increased incrementally. For example, assaults on police officers could be reclassified from Class C felonies to Class B felonies, and so on. Further, the Act will support efforts by Texas State Senator, John Coryn, and his proposed “Back the Blue Act,” which makes it a federal crime to kill, attempt to kill, or aspire to kill a police officer. In recent weeks, lawmakers in other states have also made legislative provisions that protect police in the wake of the officer-targeted shootings. In North Carolina, Governor Pat McCrory signed a bill into law this week that makes dashcam video and bodycam footage exempt from public record, except under narrow sets of circumstances. In May, Louisiana Governor John Bel Edwards signed the “Blue Lives Matter” bill into law that makes an assault on veterans, police officers, emergency responders, and firefighters a possible hate crime. Louisianans convicted of misdemeanor hate crimes against officers will be fined $500 and face an additional sentence of up to six months. About the violence on law enforcement, Governor Abbott tweeted, “Texas is saying no more,” and, “We must unite and strengthen our commitment to protect law enforcement.” Ray Hunt, President of the Houston Police Officer’s Association says, “Governor Abbott’s solution is the right approach for Texas law enforcement officers and the people of Texas who support them.” Texas lawmakers will review the Police Protection Act in the 2017 legislative session, which begins January 10, 2017. What is the New Campus Carry Law in Texas and What Does it Mean to Me? Whether you love it or hate it, Campus Carry is coming to a college campus near you, and if you are a CHL holder, you need to know how to comply with the law. After lengthy debates in both houses of the Texas Legislature, Governor Greg Abbott signed Senate Bill 11 (“Campus Carry”) into Texas law on June 1, 2015. Campus Carry will go into effect on August 1, 2016 on the 50th anniversary of the University of Texas sniper shooting— one of the first mass murders on a college campus in the United States. Who Can Carry a Handgun on a College Campus Under the Campus Carry Law? Campus Carry permits all Concealed Handgun Licensees who are at least 21 years old, have passed state and federal criminal background checks, have successfully completed a firearms proficiency test and have completed Department of Public Safety-mandated training and education, to carry firearms inside of buildings belonging to public universities and some private institutions of higher education. The new legislation, however, does not mean open carry by anyone, anywhere, any time on all property owned by a public or private university. CHL licensees must take great care to research and to understand the limits of the Campus Carry law and how it impacts the way handguns are carried and stored, or potentially face legal consequences. Can the Universities in Texas Make Their Own Rules With Campus Carry? Campus Carry allows institutions of higher education to establish policies governing the storage of handguns by CHLs in dorms and residential facilities. Public universities may also create policies around athletic venues and events, deeming them off-limits to CHL licensees. Under current Texas law, bars, hospitals, churches, and public schools K-12 are off-limits to CHL licensees and will remain off-limits under Campus Carry—and it is important to note that most large public university systems have a teaching hospital, a K-12 practicum experience at public school, a chapel, or are near campus bars. Moreover, schools may create “no-gun zones” or “exclusion zones,” but must provide effective notice about such zones. Therefore, it is extremely important for those with a CHL to know exactly which areas are permitted to have handguns, which are not, and to make plan for storage it if the CHL licensee needs to go into an off-limits area. Students should carefully read their university’s Student Handbook and Campus Code of Conduct for more information. Campus Carry removes criminal prohibitions in the Texas Penal Code on the possession of concealed handguns by concealed handgun licensees on the campuses. The new law provides institutions of higher education with immunity from liability for actions of CHLs on campus. Campus Carry mandates that an institution of higher education widely distribute the rules to the institution’s students, staff and faculty, including prominently publishing such provisions on the school’s website, and provide effective notice of the areas that are “exclusion zones.” Parents of college students may feel concerned with the new law and campus procedures. The legislature granted rule-making authority to the presidents of the university system to create campus rules and policies pursuant to S.B. 11, with the only stipulation being that public institutions of higher learning may not “circumvent the intent” of Campus Carry by “imposing administrative bans and sanctions on CHLs on their campuses.” In order to comply with S.B.11, institutions of higher learning must submit a report every other year to the state legislature and to the standing committees that describe the campus rules and policies concerning CHL licensees and the schools must explain the reason the administration has established the provisions. Residents who live in college towns (even if they are not students) should also learn about Campus Carry and the implications of being a CHL at a campus library, sporting event, artistic venue, or even the university hospital. This is no doubt a very interesting time for policy-making in Texas. Please note that this article is intended for informational purposes only and is subject to change as each public university system and private university determines campus policies based on S.B. 11. This article does not constitute or substitute legal advice. If you need legal advice, please contact our office at (817) 993-9249 for a free consultation. For more information, see also the full Campus Carry Law, including a Bill Analysis and Fiscal Note or see our Frequently Asked Questions below. Campus Carry refers to legislation, Senate Bill 11, signed into law last summer. Campus Carry will make it possible for licensed gun owners, over 21, to carry handguns onto public (and some private) institutions of higher education, in compliance with individual university policies. When will Campus Carry Take Effect? Campus Carry will take effect on August 1, 2016—at the beginning of the 2016-2017 academic year. Do I have to have a Concealed Handgun License (“CHL”) to carry my handgun? (4) complete Department of Public Safety-mandated training and education. It will be extremely important for every student with a CHL, to know exactly where to go with your handgun and to plan for where you will be able to legally store it if you must go into an off-limits area. Read your Student Handbook and Campus Code of Conduct for more information. Will Professors be able to carry guns? Yes. Professors, administrators, faculty, staff and visitors may carry under the Campus Carry law, provided they are in compliance with the law and campus policies. Does a private school have to follow Campus Carry? Maybe. Private institutions may establish policies that prohibit CHLs. So far, the following schools have “opted out” of Campus Carry. NOTE: This information is subject to change and it is up to each student, to know if your school has opted out. Can a student at a public university take a gun anywhere on campus? Not necessarily. Campus Carry allows institutions of higher education to establish policies governing the storage of handguns by CHLs in dorms and residential facilities. The public university may also create policies around athletic venues and events, as off-limits to CHLs. Under current Texas law, bars, hospitals, churches, and public schools K-12 are off-limits to CHLs and will remain off-limits under Campus Carry—and most large public university systems have a teaching hospital, a K-12 practicum experience at public school, a chapel, or are near campus bars. Schools may create “no-gun zones” or “exclusion zones,” but must provide effective notice about such zones. Barnett Howard & Williams PLLC is a criminal defense law firm located in Fort Worth, Texas. Our attorneys handle all felony and misdemeanor charges in the Fort Worth, Tarrant County area. 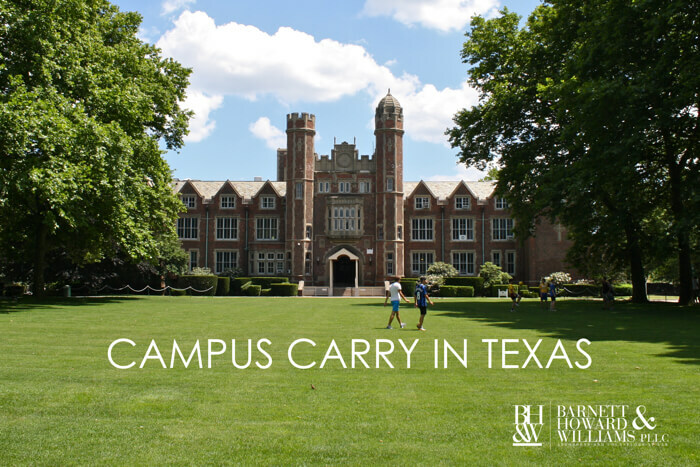 If you have questions about this post or need more information about Campus Carry, please contact us at (817) 993-9249. 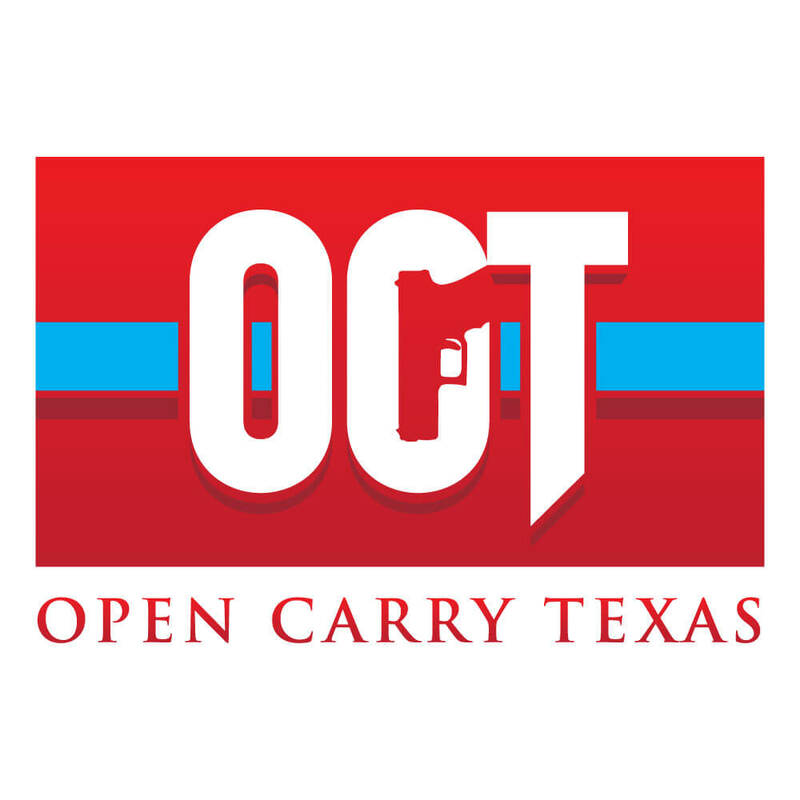 Texans love their guns and many folks in Texas are excited about the new “Open Carry” laws that were passed this year. Some people imagine a wild west where handguns are worn on the hips of everyone in town. Other are terrified that gun-related incidents will increase. Well, the new open carry laws do not come without their rules. 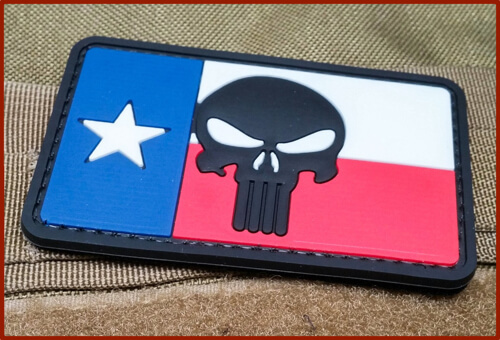 With the passage of House Bill 910, beginning January 1, 2016, Texans in possession of a concealed carry license (CHL) will be allowed to openly carry a holstered handgun. While “open carry” sounds simple enough, there is much more to it. This article explains some of the rules that Texans need to know if they plan to openly carry a handgun in 2016.
Who is eligible to openly carry a handgun? Only CHL holders may open carry. Subchapter H of Chapter 411 of the Texas Government Code sets out the basic requirements for a person to be eligible to apply for a handgun license and openly carry a firearm. 14) Have not made any material misrepresentation, or failed to disclose any material fact, in an application submitted pursuant to Section 411.174. (Perjury). *The age restriction is lowered down to 18 for honorably discharged military veterans who meet all other qualifications. What types of firearms can be openly carried in Texas? Currently, under Texas Penal Code Section 46.03, a person cannot carry, either openly or by concealment, a handgun unless that person is on the person’s own premise or inside of a motor vehicle that is owned or under the person’s control (the weapon must still be concealed if carried in a vehicle under 46.03 (a-1)). There is no language in Texas Penal Code 46.03 regarding firearms other than handguns. Therefore, there are no laws prohibiting openly carrying rifles and shotguns (subject to the “where” restrictions to be addressed below). The exception to Texas Penal Code 46.03 is that the provision doesn’t apply to those in possession of a license issued under Subchapter H, Chapter 411 of the Texas Government Code. In addition to carrying a concealed handgun under Subchapter H, the new House Bill 910 now grants the opportunity for Texans in possession of a concealed carry to openly carry a holstered “handgun.” A “handgun” is defined by Texas Penal Code 46.01 (5) as “any firearm that is designed, made or adapted to be fired by one hand.” Shotguns can be openly carried now in addition to holstered handguns as long as a person is in possession of a license granted under Subchapter H, Chapter 411 of the Texas Government Code. How can handguns be openly carried? Use a holster. Under Texas Penal Code 46.15(b) (6), a person carrying a valid CHL may carry a handgun either in a concealed manner or in a shoulder or belt holster. Under these new provisions, if the handgun is carried any other way, a person would be unlawfully carrying the handgun. Where can handguns be openly carried? 6) Within 1,000 feet of premises of an execution site on the day of an execution. In addition to the locations listed above, Texas Penal Code 30.06 prohibits individuals, and creates a criminal offense of trespass, for those who hold a license to carry a handgun when notified that their presence on the property with a handgun is expressly forbidden. To provide notice, a property owner must display written notice on the property that specifically complies with the notice requirements of Texas Penal Code 30.06. With the new Open Carry law, those that wish to prohibit others from carrying a handgun on their premises, must also post a notice in accordance with section 30.07 of the Texas Penal Code. This notice is in addition to the 30.06 sign. The term “open carry” has been loosely thrown around as new legislation has been debated and ultimately passed regarding openly carrying handguns. It is important to remember that “open carry” isn’t a free-for-all regarding handguns. “Open Carry” is still highly regulated and a person considering openly carrying a handgun should be familiar with all of these new laws and regulations, so that they do not end up needing our services. Luke Williams is a criminal defense attorney with Barnett Howard & Williams PLLC in Fort Worth, Texas. Texas has more military veterans than any other state. In the wake of the recent wars in Iraq and Afghanistan, many have difficulty transitioning from military service to civilian life. Some veterans suffer from PTSD or Traumatic Brain Injuries and others fall into addiction. Plagued by these ailments, some Texas veterans find themselves in the criminal justice system. Recognizing a need, Texas has led the nation in addressing veteran criminal issues through special courts. Beginning in 2009, these court were designed to provide treatment and accountability for veterans in an effort to keep them out of the criminal justice system. There are currently 20 veterans courts in the state. Under current law, which created the veterans courts programs, only veterans who suffer from an injury received while serving in a combat zone or other similar hazardous duty area are eligible to participate in a veterans court. Some veterans that have suffered similar injuries the occurred outside of a combat zone are not eligible despite the fact that the struggle for rehabilitation remains the same. This has been a point of frustration for Fort Worth criminal defense attorneys who regularly handle cases involving Texas veterans. We were often met with opposition when trying to admit a veteran to the specialty court program. S.B. 1474, which takes effect on 9/1/15, broadens the eligibility for veteran participation in these special courts. The bill would provide the courts with more flexibility over who was admitted into the program by removing the requirement that any illness or injury have occurred “in a combat zone or other similar hazardous duty area.” There is also another provision that gives courts discretion to admit a veteran if he/she does not fit any of the other categories. Finally, the amendments allow a veteran who is being supervised by a veterans’ court program to transfer counties to another program if desired. These are all good changes that will help veterans and make these specialty courts worthwhile. See the 2015 Veteran’s Court Update. DWI Update: Some clients want to see their DWI video. Some don’t. Some want to take it home and show their friends and some want to dig a deep hole and bury it away forever. Since the passing of the Michael Morton act, regardless of their clients’ wishes, criminal defense lawyers could not provide a copy of the DWI video without first obtaining a court order or prosecutor permission. This all changes on 9/1/15. Art. 2.139. VIDEO RECORDINGS OF ARRESTS FOR INTOXICATION OFFENSES. (4) a procedure in which a specimen of the person’s breath or blood is taken. Now (beginning 9/1/15) DWI defendants are entitled to receive a copy of the DWI video (if they want it). There is no clarification regarding whether the defense attorney, or the DA may provide the copy, but at a minimum it may come from the police agency. Barnett Howard & Williams PLLC practices DWI defense in Fort Worth, Texas. Our office is located in Sundance Square in downtown Fort Worth. Call (817) 993-9249 for free consultation of your DWI case. The new values for these offenses will apply to all offenses committed on or after September 1, 2015. For offenses that pre-date 9/1/15, that theft offenses will remain under the old statutory scheme. More than $300,000 is a First Degree Felony. The change in law also includes a savings clause. This clause provides that the change in law applies only to an offense committed on or after the effective date of the article. As such, an offense is committed before the effective date of the article if any element of the offense occurs before the effective date. This savings clause is an important factor when dealing with aggregate theft. Aggregate theft is an offense where two or more thefts were committed “pursuant to one scheme or continuing course of conduct” and the amounts are combined to determine the grade of the offense. Tex. Penal Code § 31.09. Pursuant to Section 31.09 of the Texas Penal Code, aggregate theft may be considered as one offense—it is a sum of all its parts. The Court of Criminal Appeals has held that the State need only prove beyond a reasonable doubt that the defendant unlawfully appropriated enough property to meet the aggregated value alleged. Since the value alleged will determine the grade of offense charged, applying the correct statute is essential. 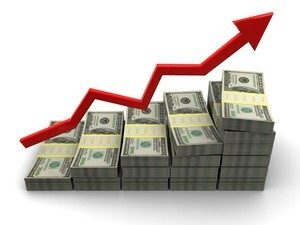 How Does the New Value Ladder Apply to Aggregate Thefts? The Court of Criminal Appeals has held time and time again that we are to interpret statutes in accordance with their plain meaning unless the language is ambiguous or the plain meaning would lead to absurd results. Thus, applying the plain meaning of the savings clause found in Section 31.09, the former law’s penalties apply to the offense of aggregated theft if any element of a continuing theft was committed before the effective date of the new law. The Court of Criminal Appeals held that this “interpretation does not lead to absurd results because one could reasonably conclude that the legislature intended for the old penalties to attach to a scheme or continuing course of conduct that was begun before the effective date of the new law.” Dickens v. State, 981 S.W.2d 186, 187-88 (Tex. Crim. App. 1998). Thus, if a defendant is being charged with aggregate theft and any element of their charge occurred before September 1, 2015, former law will apply to determine the grade of the offense. The Fort Worth criminal defense attorneys at Barnett Howard & Williams PLLC handle all ranges of property crimes from simple shoplifting to armed robbery and everywhere in between. If you are under investigation for a property or theft offense or have already been charged, contact Barnett Howard & Williams PLLC today for a free consultation of your case at 817.993.9249.